The retail space is competitive and ever-changing. No one wants to be held to a 12-month launch timeline costing half a million dollars or more for an ecommerce campaign, website or headless commerce initiative. Now, enterprise brands are no longer strapped to expensive site launches to support ecommerce channel business initiatives. Ecommerce technology is no longer a money pit. Retail organization become more complex as they scale. Brand IT teams, engineers and developers must maintain brand safety while also balancing the need for speed from the marketing organization. Historically, getting to market quickly has implied the giving up of safety. Or, conversely, making sure the ecommerce technology is safe, reliable and resilient meant slowing down the pace of innovation. This push and pull between IT and marketing teams has often made ecommerce scalability and innovation for established brands a longed for dream. Something that just was not possible. As a result, disruptive brands have gone direct-to-consumer with new business models and similar products, building community and brand equity along the way. And these brands have done so using SaaS ecommerce technologies that lower the cost barrier to launching and scaling an ecommerce business. Now, more and more enterprise brands are looking to SaaS to better compete in the modern retail ecosystem. But not all SaaS platforms are the same. “Companies looking to run a more effective online business are increasingly making the move to SaaS for its flexibility, scalability, and operational efficiency, and in this regard, BigCommerce is a true industry leader. SaaS platforms are multi-tenant software solutions hosted in the cloud. Their extensibility functions on the use and call power of APIs – which enable micro-service architecture. It is the APIs which allow the marketing team their innovation, and the business operations teams the proper system syncing. This is how you build end-to-end systems that enable innovation at speed and don’t break already established internal best business practices. But, for the IT team, security still needs to be addressed. All SaaS platforms maintain Level 1 3.2 PCI Compliance, which protocols how to encrypt and manage sensitive credit card information. But SaaS platforms handle personal data aside from credit card information differently. BigCommerce is multi-tenant, but not at the database level. Our firewalls, load balancers and application servers can accept requests for any store on the platform, but they have to pull that data from the store’s database using a unique set of credentials for authentication. This means it’s highly unlikely, nearly impossible, for a developer to accidentally expose one store’s data to another. BigCommerce also does encryption at rest, in which we encrypt the data at AES-128 encryption level in database tables that contain Personal Data. Shopify is multi-tenant all the way down to the database level. Shopify does not do encryption at rest, but will soon use Disk Encryption, which will do encryption at rest at the filesystem level. If someone cracked the filesystem encryption, the database would be exposed (unlikely, but a possibility). Demandware creates bespoke solutions so it is likely to vary per customer. It is this difference in multi-tenant data security, in combination with API strength and call volume limitations that win over IT teams from established retailers. But, how then do these retailers implement their new, cost-effective systems? It varies by brand and their particular problem to solve, but there are 6 typical ways this is done. From Toyota to Skullcandy and everyone in between, Fortune 500 and enterprise retailers are exploring SaaS ecommerce options for fast GTM while maintaining necessary security protocol. See who they are, how they are doing it and test drive your own sandbox site. Download your use case guide now. Legacy B2B and wholesale brands are needing to launch additional B2C channels. 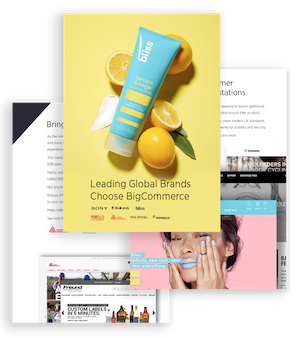 Here are the top reasons why established brands like Chapstick and Natori are launching direct-to-consumer sites alongside their highly profitable wholesale channel. Test new products in new regions: Being able to test new products in new regions by swinging up sites in those new areas gives established retailers ample testing power, saving them time and money on expensive in-country deployments. Build a direct line to what customers are asking: Brands without a direct-to-consumer channel have a huge lapse in time from when they develop an item to when Walmart (or their wholesale partners) will sell it. Why? Because the brand has no way to prove the customer will want the new item. With a direct-to-consumer site, these brands can get imperial evidence in a short period of time by collecting tons of customer data points. For instance, would Heinz have launched purple ketchup if they could have tested it on a direct-to-consumer site? These direct-to-consumer sites must be cost-effective, meet modern UX standards and pass procurement’s strict requirements for stability and security. See how these enterprise brands make this work. As the new generation of buyers ages into management positions, more and more B2B customers buy online –– and expect the same B2C UX experience they get elsewhere. This market is expected to account for $6.7 trillion by 2020 – 27% of all B2B sales. Heavy reliance on a single source of truth OMS or ERP has historically halted B2B brands from online initiatives. Robust APIs with unlimited call volumes make BigCommerce agnostic to your single source of truth. Make millions online, without tripping up your delicate backend balance. See how these B2B brands make it work. “Our retail clients are increasingly looking for an ecommerce platform that enables the business to focus on generating sales instead of maintenance and integration costs. Employee benefits at large organizations include first access to company deals and percentages off merchandise or company-required purchases from uniforms to equipment. Your HR team doesn’t have time to also be a tech center. Now, using SSO/SAML to authenticate employees, you can launch an un-indexed site no one can find, and no non-employee can enter. From Assurant to Sony to Pepsi, see how these enterprise brands launched B2E deployments so successful, they then launched B2C sites. Ecommerce has disrupted the business model of every industry – and the education industry is no different. This is why universities, traditional textbook suppliers and online publishers partner with BigCommerce. From launching a direct to consumer site to sell books and downloadables to leveraging a site for B2B deployments, see how these brands are pre-populating negotiated prices, selling in bulk and building educated communities online. Delaware North is one of the largest hospitality and food service companies in the world. Founded in 1915, the family-owned and privately-held company has global operations at high-profile places such as sports and entertainment venues, national and state parks, destination resorts and restaurants, airports, and regional casinos. Delaware North has annual revenues of $3 billion in the sports, travel hospitality, restaurants and catering, parks, resorts, gaming, and specialty retail industries. Several of Delaware North’s clients and operating locations –– including the Carolina Panthers at Bank of America Stadium and the National Park Service at Grand Canyon National Park –– use BigCommerce to power their fan sites and drive additional online revenue from loyal consumers. Technology shouldn’t hinder your proven processes nor your future innovations. You own your brand experience and operational best practices. That’s why we’ve taken an API-first approach – called Headless Commerce – to allow brands of all sizes to plug us in and ramp up sales without disrupting established protocols for which both employees and customers recognize your brand. You can’t actually see headless commerce in action, though. It is a set of API usage and backend processes by which brands increase speed to market, data security and user experience for employees and customers alike. Here are a few brands currently implementing headless commerce on BigCommerce. The industry is constantly changing. Disruptive brands (micro-brands) are growing. Your business needs to build brand equity – safely and quickly. SaaS is how. Multi-tenant is how. The devil is in the details. Get a free sandbox store to test drive it yourself now. “We’re seeing a trend with large brands leveraging SaaS ecommerce platforms to design shopping experiences in a fraction of the time and cost as legacy systems without compromising requirements. These shopping experiences vary from creating unique direct to consumer shopping channels on social media to custom purchasing portals that serve a B2B customer segment. This is all representing a shift in approach, ‘agile commerce’, that brands are taking in order to keep pace with rapidly evolving customer needs. Learn from brands using open SaaS to power unparalleled ecommerce experiences. See what open SaaS can do for you.